While the clot-busting drug, tPA, has been the gold standard to treat stroke for decades, researchers from Florida Atlantic University’s Schmidt College of Medicine and Boca Raton Regional Hospital’s (BRRH) Marcus Neuroscience Institute are taking treatment options to the next level. Jang-Yen (John) Wu, Ph.D., distinguished professor of biomedical science in FAU’s Schmidt College of Medicine, and Brian Snelling, M.D., chief of cerebrovascular and endovascular neurosurgery and medical director of the Marilyn and Stanley Barry Center for Cerebrovascular Disease and Stroke at the Marcus Neuroscience Institute and BRRH, have joined forces to combine a breakthrough interventional procedure for stroke with a novel drug compound that has neuroprotective properties. At BRRH’s Marcus Neuroscience Institute, Snelling performs a procedure called a mechanical thrombectomy. He uses a stent within the walls of the artery to retrieve and remove blood clots in stroke patients. This method significantly reduces stroke-related disability and death, and one out of every two patients can walk out of the hospital after they have the procedure. Snelling likens it to the equivalent of giving antibiotics to a patient with pneumonia. However, time is of the essence. That’s where Wu’s drug discovery efforts could make all the difference and give Snelling a wider timeframe to perform this procedure while protecting patients against further damage from blockages. 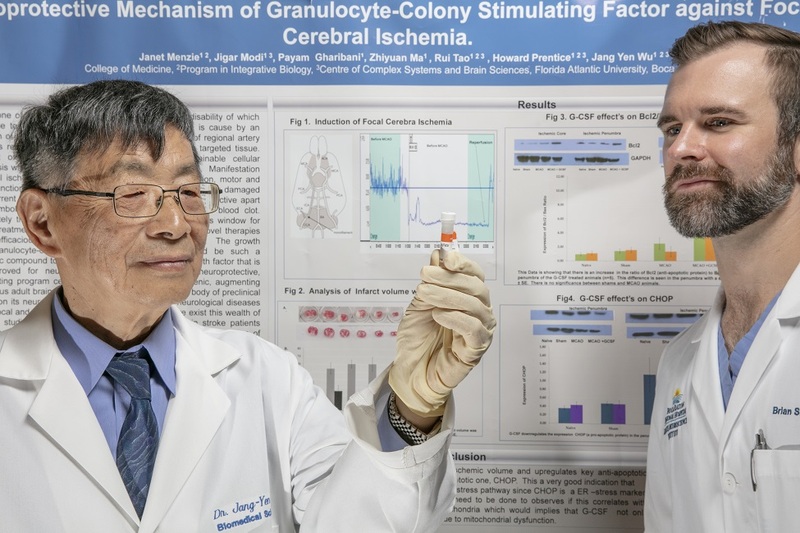 Wu has been developing a therapeutic method to replenish new brain cells using granulocyte colony-stimulating factor (GCSF), an FDA-approved drug used to enhance blood cellular development. The idea is to administer GCSF during a mechanical thrombectomy directly to the site of the blockage, providing a more specific method of drug delivery right to the target. Wu and Snelling anticipate that this method could be very effective because GCSF would go directly to the site of damage. GCSF could be a powerful growth factor because of its ability to preserve the central nervous system, suppress cell death and at the same time elicit neurogenesis as well as angiogenesis. GCSF works the same way for other neurological diseases such as Parkinson’s disease due to its neuroprotective properties. Wu received a patent with the United States Patent Office (USPTO) for the neuroprotective properties of GCSF in stroke. A patent application with the USPTO also has been filed for the neuroprotective and neurogenesis properties of GCSF gene therapy for treatment of stroke and Alzheimer’s disease. Wu and Snelling are working with South Florida-based CHS Pharma, Inc., to further develop and commercialize GCSF and this new treatment method. Spearheaded by Stephen Chakoff, director and founder, CHS Pharma, Inc. has an intellectual property portfolio for potential treatments related to ischemic stroke, dry macular degeneration and other age-related disorders such as Alzheimer’s disease. They have demonstrated efficacy in the basic science and preclinical work for GCSF and want to move the research to the next phase – small-scale clinical trials. Wu and Snelling both serve on the company’s scientific advisory board. Stroke is the third leading cause of death and disability in the U.S., with one person dying every four minutes. Nearly 800,000 people have a stroke each year and about 87 percent are ischemic strokes, where blood flow to the brain is constrained or clogged. While there have been significant strides made in stroke research as well as major advances in stroke care, effective treatments are still insufficient and require a continued quest for new remedies.